From the antique cast-iron stove in the kitchen to the ancient wood-paneled radio in the living room, the decor in The Easton Home comes straight out of the 1930s, '40s and '50s. Which is by design. The old-fashioned rooms are in the dementia wing of the elder-care facility and serve an important function. They're intended to make residents feel at home, help them retrieve memories and get them talking about their younger selves. "As soon as they walk in, they become comfortable... and it just takes them back to a place that they're familiar with," said Jennifer Woolley, the home's community life coordinator. "They can talk about their stories and share their experiences, so you're just walking into the past, and they love it." Nursing homes and assisted living facilities are increasingly using sight, sound and other sensory cues to stimulate memory and provide a touch of the familiar for people with Alzheimer's disease and other forms of dementia -- part of a broader shift toward specialized memory units that care for this large and growing segment of the population. About 5.3 million Americans have Alzheimer's, a number expected to rise dramatically over the next few decades as Baby Boomers enter their twilight years. In Olathe, Kansas, the Cedar Lake Village retirement community is building a memory-care assisted-living facility that includes a 1968 Ford pickup in the courtyard for residents to sit in, tinker on, listen to music "and reminisce about their first vehicle," said Joanna Randall, the facility's executive director. In England, Grove Care Ltd. has "Memory Lane" on the grounds of its dementia-care facilities, featuring a 1950s-themed traditional pub, post office and grocery store. The Easton Home, about 50 miles north of Philadelphia, converted an employee break room and a multipurpose room into its own version of Memory Lane. Experts say dementia sufferers' memories can be triggered by an object, a sound, a smell. Danish researchers found that dementia patients placed in a setting that reminded them of their youth were able to summon more autobiographical memories than a group studied in an everyday setting. While reminiscing won't reverse the progression of Alzheimer's and is not guaranteed to work for everyone, it can improve mood and reduce agitation and wandering, said Ruth Drew, director of family and information services at the Alzheimer's Association. "Sensory cues are really the secret to providing what we call comfort care," said Marguerite McLaughlin, who's in charge of quality improvement at the American Health Care Association, the country's largest trade group for nursing homes. Chris Boyce partly credits the surroundings at The Easton Home - and the conversations they start - with making her time with her grandmother more enriching. They often sit in the kitchen, where an antique ironing board and wringer washing machine recently prompted 90-year-old Olga Deacon, who has dementia, to explain how she used to help her mother with the ironing. "It took me forever. She'd tell you, 'This has to be straight, that has to be straight.' You had to get the creases straight," recalled Deacon, laughing at the ancient memory. "It winds up becoming a conversation I wouldn't know to start with her," Boyce said later. "I've learned more about her in the two months she's been here than I think I knew before that in a lot of ways." 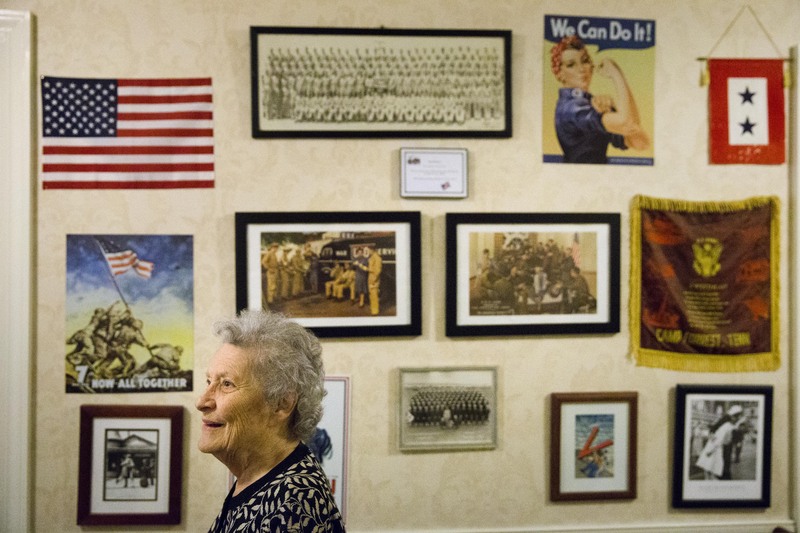 Down a hallway, themed "memory walls" devoted to travel, marriage, parenthood, cars, dogs, fishing and the military stoke conversations among residents, staff and family members. Small placards offer prompts - "How did you learn to drive?" - to get residents talking about what life was like 60 or 70 years ago. The home also uses a touch-screen system to engage seniors in a wide variety of mind- and memory-stimulating pursuits, from puzzles and word games to airings of vintage TV commercials. "Memory units like this, who have made a special effort to create spaces that kindle pleasant memories, make a lot of sense, and should become more and more of the norm," said Dr. Jason Karlawish, co-director of the Penn Memory Center at the University of Pennsylvania School of Medicine. He raised a practical consideration. "The concept of putting together a memory unit with images and other sounds and other imagery that evoke a certain time raises the question of what time, what images, when and how to update. But I'd rather have those conversations and debates than not have them." In The Easton Home's retro living room, 81-year-old resident Decima Assise, who has Alzheimer's, danced cheek-to-cheek with her longtime companion, Harry Lomping, to the strains of "Maria Elena," a 1941 chart-topper for Jimmy Dorsey. The song wafted from an iPod hidden inside the radio cabinet. "When the music comes on, she wants to dance," said Lomping, 84, who visits Assise nearly every day. "I think it revives something, some feelings."